Please note that the content of this book primarily consists of articles available from Wikipedia or other free sources online. Leslie Roe "Bubba" Floyd (June 23, 1917 - December 15, 2000) was a Major League Baseball shortstop who played in three games for the Detroit Tigers in 1944. The 26-year-old rookie stood 5'11" and weighed 160 lbs. 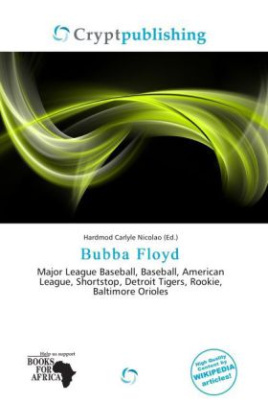 Floyd was one of many ballplayers who only appeared in the major leagues during World War II. From June 16 to June 18 he was in the starting lineup for three games against the St. Louis Browns at Briggs Stadium. He hit very well, going 4-for-9 (.444) with a double and a run scored. He drew one walk to give him an even .500 on base percentage.